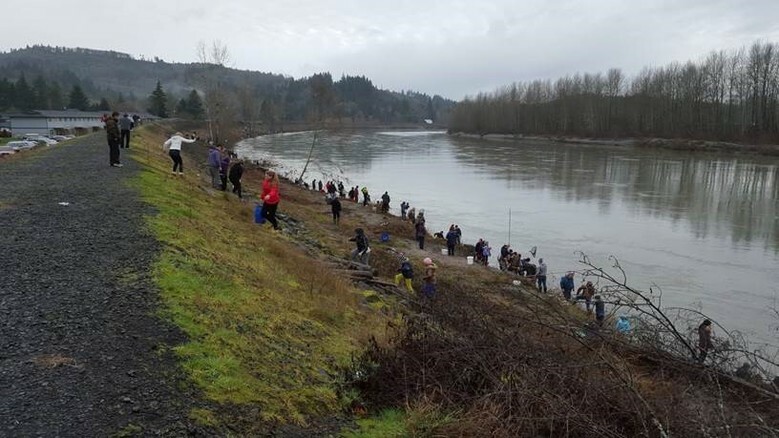 Dip-netters line the banks of the Cowlitz River and scenes like this have been just a distant memory in recent years including 2019 which will likely not have any opportunity. Photo courtesy of WDFW. The Washington Department of Fish and Wildlife (WDFW) released their 2019 smelt stock assessment and filling a bucket of these silvery fish in the Cowlitz and Columbia rivers will be like finding a pot of gold at the end of a rainbow. “We are not considering fisheries in 2019, and there are no signs of smelt yet,” Ryan Lothrop, the WDFW Columbia River fishery manager and Bill Tweit, the WDFW fish program special assistant said in a joint phone call. The assessment indicated the smelt return is expected to be much smaller in magnitude than the 2018 return which was a paltry 370,000 pounds and way down from 1.6-million pounds in 2017. Last year, there wasn’t a sport dip-net fishery in the Cowlitz River and commercial fisheries from 2014 to 2018 consisted of eight fishing periods over four weeks on the Columbia River mainstem. For those out of the loop, smelt returns were a “big deal” for sport dip-netters from the 1980s to the early 2000s when hordes of people in waders and dip-nets would line the Cowlitz shoreline. Since then smelt returns have steadily declined to the point where they were listed on the Endangered Species Act in the spring of 2010. Commercial and recreational fisheries were subsequently closed in 2011-2013. There was one day of sport dip-netting in 2017 when 1.6-million pounds returned; and one day in 2016 when 5.1-million pounds returned along with opportunities both years on the Sandy River in Oregon. There were also fishing seasons – five days total in 2014 and two days in 2015 –plus opportunities on the Sandy River. The assessment stated smelt abundance increased steadily from 2011 to 2014 when it peaked at 16.6-million pounds. Ocean environmental conditions were favorable for marine survival during 2012-2013 but then deteriorated dramatically although improvement was seen the past two years. 2018: 370,000 pounds, with 110 pounds caught in non-tribal commercial fishery, and no catch for sport and tribal fisheries. 2017: 1,600,00 pounds, with 5,090 pounds caught in non-tribal commercial fishery, 540 pounds in sport fishery and 1,900 pounds in the tribal fishery. 2016: 5,100,00 pounds, with 4,820 pounds caught in non-tribal commercial fishery, 141,050 pounds in sport fishery and 8,330 pounds in the tribal fishery. 2015: 11,400,000 pounds, 16,550 pounds caught in non-tribal commercial fishery, 290,770 pounds in sport fishery and 10,400 pounds in the tribal fishery. 2014: 6,600,00 pounds, with 18,560 pounds caught in non-tribal commercial fishery, 203,880 pounds in sport fishery and 6,970 pounds in the tribal fishery. 2013: 9,600,000 pounds, with none caught in non-tribal commercial fishery, no catch in sport fishery and 7,470 pounds in the tribal fishery. 2012: 3,200,00 pounds, with none caught in non-tribal commercial fishery, no catch in sport fishery and no data available in the tribal fishery. 2011: 3,300,00 pounds, with none caught in non-tribal commercial fishery, no catch in sport fishery and no data available in the tribal fishery. The International Pacific Halibut Commission (IPHC) meeting wrapped up last Friday (Feb. 1), and there will be an uptick for the West Coast catch quota due in part to a proposal by the Makah Tribe on the northern coast. It was a joint effort by all fishing constituents and fishery biologists and managers along with several Makah tribal members who were determined that every user group benefit from the proposal, which also had the support of IPHC fisheries managers. The approved catch quota for entire West Coast (Marine Catch Area 2A) is 1.65-million pounds for sport, tribal and non-tribal commercial fisheries compared to 1.19-million pounds in 2018; 1.33-million in 2017; and 1.14-million in 2016. Washington sport anglers will get a catch quota of around 277,000 pounds an increase of 52,000 pounds compared to 225,366 in 2018 (237,762 in 2017, and 214,110 in 2016, 2015 and 2014). A breakdown is 77,549 pounds in Puget Sound (60,995 last year); 128,187 pounds for Neah Bay and La Push (111,632); 62,894 pounds for Westport (46,341); and 8,467 pounds for Ilwaco (11,682). Preliminary sport fishing dates were approved back in late fall for Neah Bay, La Push, Puget Sound and Strait of Juan de Fuca (Marine Catch Areas 3, 4, 5, 6, 7, 8, 9 and 10 only). They are May 2, 4, 9, 11, 18, 24 and 26; and June 6, 8, 20 and 22. On the southern-central coast at Westport (Area 2) the tentative dates are May 2, 5, 9, 12 and 24. The southern coast at Ilwaco (Area 1) opening dates will be decided through consultation with Oregon Department of Fish and Wildlife although Washington subarea dates proposed were May 2, 5, 9, 12, 24 and 26. If sufficient quota remains then the Columbia River subarea would reopen two days per week (Thursday and Sunday) after May 26. In all areas the daily limit will stay at one halibut with no minimum size limit. 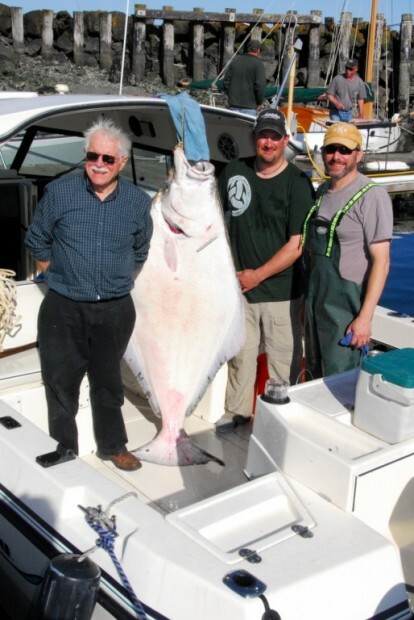 The average size of halibut in 2018 at Neah Bay and La Push was 18 pounds (same in 2017); Ilwaco was 15 pounds (14); Westport was 17 pounds (16); and Puget Sound was 23 pounds (24). The National Marine Fisheries Service will make final approvals on halibut fishing dates and catch quotas sometime in March or sooner.